A single line of built-up areas is easily seen in Waterloo Region satellite imagery — this is the Central Transit Corridor. The planned light rail line and the express bus line to Cambridge would connect four downtowns, the university district, three major commercial areas, and many corporate and industrial campuses — along with a quickly growing supply of housing. In the context of a redesigned bus network and strong planning policy, LRT (light rail transit) is the infrastructure necessary to manage growth and provide for the region’s economic and environmental health. Most of the tremendous post-war growth here has been suburban, but the area near the LRT route has still grown by 50% or more since 1955 — the last year of interurban trains. If that was it, light rail wouldn’t make sense. But the plan looks to 2031, and the province projects more than 200,000 new residents by then. The Region’s new Official Plan implements provincial targets of 40% of growth occurring in the urban cores. This will more than double the population and jobs along the Central Transit Corridor. A light rail system will both help attract this development to the downtowns, and handle the resulting demand for transit along the spine of our region. It would also be a more environmentally and financially sound approach than ramming wider roadways and more parking into our downtowns. Many have called for more buses instead of rail. But this isn’t either-or. 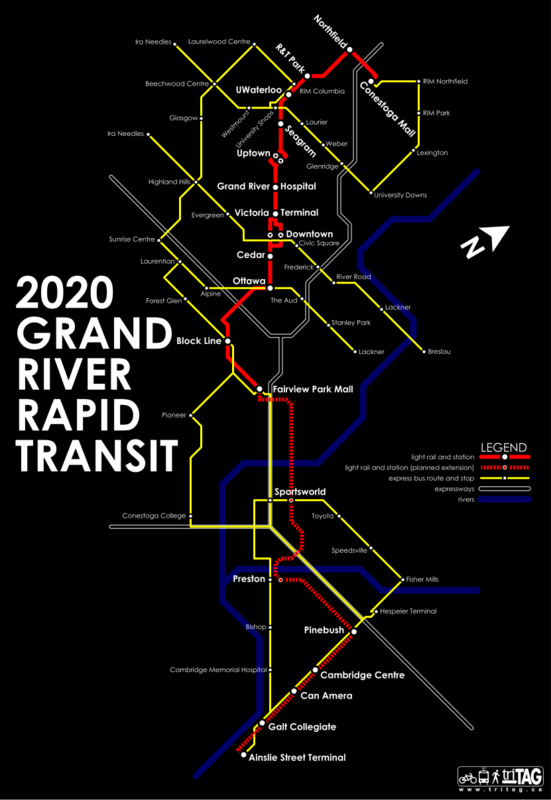 In fact, the recently approved Regional Transportation Master Plan calls for a dramatic ramping up of the Grand River Transit budget — tripling per-capita funding within twenty years. The plan calls for five new express bus routes in the next five years to service other major corridors, for more frequent and later service, and a redesign of bus routes to a more grid-like network to connect with the light rail and the express routes. However, simply more buses won’t work in the Central Transit Corridor. Already, each direction of King Street between Waterloo and Kitchener sees 12-15 iXpress and Route 7 mainline buses an hour. Which is great for riders now. But when the population and jobs more than double, so will transit ridership — or actually more without road expansion. With buses as they are now, 20-30 buses an hour is essentially the limit. Past that point they bunch together and form jams at busy stops. For them to handle the ridership we would need a bus highway through our downtowns, with passing lanes and level platforms. For most of the cost of an LRT system, it would get us dozens more buses per hour polluting our downtowns with diesel fumes and noise, and would only postpone the capacity issues. LRT, in addition to its smoother ride and quieter and friendlier electric propulsion, has larger vehicles that can be coupled in trains. Less manpower is needed to operate it, and more and bigger doors allow for low dwell times at stations — which are the main capacity bottleneck. And more than just funneling growth into central areas, the inflexibility of light rail will be able to guide development to occur alongside transit and in a way conducive to transit use. We’re finally realizing that our resources are finite. In the post-war era, anything was possible. Technology would solve all problems, land was plentiful, gas was cheap, and everyone could drive their car from the idyllic suburbs to work downtown. We know now that sprawl comes with costs to the environment, costs to our health, and costs to our wallets — it’s expensive to build streets and lay down infrastructure to serve low densities at the edge of the city. We’ve already chosen to put a limit to sprawl. Now it’s time to follow through with the transit service and infrastructure that will grow our Region up and not out. Today’s issue of The Record also carries my op-ed in support of light rail for the Region of Waterloo. It mainly focuses on light rail as the natural evolution of the rapidly growing iXpress bus route. While TriTAG strongly supports the light rail project, it is by no means a single-issue group and is also focusing on issues relating to transit and urban infrastructure in the Region, including ones addressed in this blog. On June 24, Waterloo Regional Council nearly unanimously endorsed the plan for light rail between Waterloo, Kitchener, and Cambridge. Pending firm commitments from provincial and federal governments, the first stage will consist of light rail between Waterloo and Kitchener and temporary adapted bus rapid transit between Kitchener and Cambridge. The case for LRT in the region is solid, but it is of course unusual for North America to date in how proactive it is. the transport politic wrote about the plan, saying we would be the “smallest in North America to build a modern electric light rail system.” Hamilton — the city with a bus system called the “Hamilton Street Railway” — is now working on a plan for rapid transit as well, with a strong citizens’ push for light rail. GO Transit is slated to bring commuter buses to Kitchener in a few months, and trains to Guelph and Kitchener by 2011. The City of Cambridge and the Region of Waterloo are pushing for extending GO trains to Cambridge via Milton. Most interestingly, in light of the LRT plans here and under the same provincial pressure to grow up and not out, the even smaller city of Guelph is now going to consider light rail in a review of its transit system. I think as it progresses into the procurement and construction stages, the Region of Waterloo light rail plan will serve to tip transit in Southwestern Ontario to something more serious and more usable. Currently, public transit infrastructure is assumed to be something for large cities (at least in North America), and our plans will show otherwise. First will be Cambridge, which will be increasingly clamoring for its light rail extension. Other cities and areas — Hamilton, Guelph, London, Brantford — will consider light rail and bus rapid transit (BRT), and people there will know that LRT is a serious option, and that BRT is a pale imitation. Cambridge and Guelph will get some kind of rail link along an existing right-of-way. GO Transit will perhaps provide the missing link between Kitchener/Cambridge and Hamilton. And once the LRT is in place in Waterloo Region (if not before then), we will certainly start exploring additional transit infrastructure, such as to St. Jacobs and Elmira and along cross-corridors. People in Southwestern Ontario will realize that true, useful, and pleasant transit is possible, and will stop being satisfied with token bus service and congested roads. And the Region of Waterloo will lead the way. It is insightful to contrast the two main complaints about the recommended light rail proposal. Some say that we shouldn’t build expensive and inflexible light rail, that we should spend less money on an expanded bus system. They claim buses are just as good as trains, but are cheaper and more flexible. Well, to say nothing of the positive impact of a visibly permanent route, I will note that people in the real world vastly prefer trains to buses. Just look at the Cambridge residents angry that they’re not yet getting the train! They’re upset because they’re getting left with only buses, and it speaks volumes about people’s true feelings about them. Those who have the choice will continue to avoid buses, but it is precisely these people who we need to be enticing out of their cars. I, for one, would prefer seeing trains to Cambridge sooner rather than later. However, if we don’t build light rail at least in K-W, no one will leave their cars, and all of us in the region will bear the resulting costs of sprawl and roads. The Waterloo Spur alternatives should not be treated as opposing alternatives but as an operations issue which should be seeking to serve both corridors over the long-term. As currently structured, the alternatives create a fundamental choice between a more “hidden” LRT system and one that is open and public along the King Street alignment. There was concern that the physical environment and walking distances in the R&T Park were not currently supportive of transit use, whereas the King Street alignment had the potential to contribute to the ongoing intensification along the corridor and capture ridership from Sir Wilfrid Laurier University. It was noted that if the initial investment were to occur along King Street, a potential branch along the Waterloo Spur could be created at anytime in the future and that this could be tied to development within the R&T Park. That’s commentary from the expert panel cited in the Region’s recent report on the preferred Rapid Transit plan. I agree with that assessment, and think that if only one of the routes has to be built at the outset, it should be the King Street route, which connects Laurier, supports development at King & University, and provides for redevelopment potential along the suburban-looking King & Weber area. This is as opposed to the R&T Park, which is huge and spread out, much of it still far from any future light rail station. However, I do not believe this is the best way to provide for transit and development in Waterloo. I think both routes should be constructed at the beginning, and furthermore that there should not be a weird and confusing detour from King that there is right now in the plans. Let’s assume that my previous suggestion of keeping both tracks on Caroline in Uptown Waterloo is followed. North of that, half of the trains would return to King, and go all the way up to Conestoga, and the other half would follow the spur line all the way to the St. Jacobs Market, returning via King. This would form a useful loop. See the map at the bottom of this post. I believe my proposal is a much more complete solution to transit in Waterloo than just one branch of LRT. Streetcars make a lot of sense for cross-corridors that are ripe for development of vibrant streets. In Waterloo, University Avenue is such a place. I haven’t studied the rest of the region, but I’m sure that several of the current cross-corridor bus plans could be fruitfully replaced with streetcars. It is probably unnecessary to explain why streetcars are a better driver of development and ridership, so I won’t do it here. What this means for the current plan is that Council should be encouraged to have it both ways, and to construct both routes. Cross-corridor streetcars can be separate projects, and they can in fact be started immediately. A University Avenue streetcar would make itself useful very quickly.